Plot: The plot this this film is about a handyman named Homer Smith. This handyman helps a bunch of immigrant Nuns build a chapel. Now these Nuns believe God has sent this man to help. Growing up there was three guarantees in my childhood. One, there was always movies playing, cinema was my babysitter. Two there was always westerns playing at my Aunt Judy’s and Uncle Earl’s house who always watched me, and three I was guaranteed to see a Sidney Poitier film every week. My father was a huge fan and so every time we went to the video store there would be a VHS or Laser Disc (for all you new breeds that’s what came before DVD/Blu-ray or digital “smirks”) of a Sidney movie rented. Lilies of the Field was one that played many times. It’s one of the few good memories I had with my father. So when I learned Twilight Time was releasing it on special edition Blu-ray I was very happy. And they did a fantastic job, amazing transfer to high definition. It’s looks absolutely beautiful. Nothing really needs to be said about the amazing, one of a kind Sidney Poitier that has not already been said. He was one of the great actors and pioneers of film performances. One of the best African American actors to ever grace Hollywood, one of the best actor’s period and Lilies of the Field is a prime example of a perfect, memorable film, that stands out above and beyond a lot of films. Sidney won his Oscar for this role, and he deserved it. 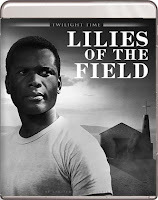 Besides A Patch of Blue (which is my all-time favorite Sidney film and also on my list of 100 greatest films of all time) and the amazing In Heat of the Night, Lilies of the Field is a defining acting role that any actor could hope to accomplish. Also starring the amazing, beautiful one of a kind actress Lilia Skala. She was truly a golden ticket of perfection in her career. She was able to transcend off the screen through her performances, simply put, see made you believe her characters. Her role in Lilies of the Field as mother Superior was one of the best performances ever in film, she was nominated for an Oscar for this role, which might I add she should have won it. Also what makes this film stand out, and Sidney's performance stand out is this was a history making role. This was the first time that African American Male won an Academy Award. I also have to pin point out a wonderful character actor that is in this. In his vast career he acted in more than 200 performances. He died at the young age of 62 but left so many small roles. Stanley Adams never got the just duo he deserved, but one thing was for sure you always remembered his face, or side character. He played many roles on countless television performances. Many might remember him from the part Rusty Trawler in 1961’s Breakfast at Tiffany’s. It was great seeing him in the part of Juan in Lilies of the Field all over again. I have seen this film so many times I have most of the lines memorized or at least the parts I really love. It was great seeing it again, it’s been over 10 years since I seen it, and what better way than to experience it with a wonderful new outlet and transfer to glorious Blu-ray. I thought this was another great experience supplied by Twilight Time. This was directed by Ralph Nelson. Nelson was a director that never had that house hold name reality as such other directors had. Nelson is one of those director’s that knew how to pack a punch with his films. Many of his films where racial in nature, touching on emotional side of storytelling, or adding tension to his films. That’s another thing that was interesting about his directing career, he directed a vast array of films, from drama, comedy, war, action, to TV, he dabbled in just about anything. He even directed the science-fiction horror film 1976’s Embryo. He was a one-man reality that explored just about anything in the films and TV he made. It was great seeing his triumph, Lilies of the Field on this wonderful special edition Blu-ray lovingly brought out on Blu-ray by Twilight Time. Great films should be honored and this is one of those films chosen perfectly. As I have stated I have seen this movie so many times, and I honestly can say this film has never looked any better. Twilight Time did another great job in creating a new worthy outlet to praise this wonderful film with. Loved the transfer, looks amazing and most of all sounds amazing also. High quality. Beautiful in audio and video, that’s all one should have to say. Fantastic Job. Isolated Score Track (with some effects). The man behind the music for this film needs no introduction to cinema fans. The one and only Jerry Goldsmith. Goldsmith has been a part of some of the greatest film scores both small and large. Just to mention a few, The Omen, Alien, Poltergeist, The Secret of NIMH, Gremlins, Hoosiers, Total Recall, Basic Instinct, Rudy, L.A. Confidential, The Mummy, Von Ryan’s Express, The Blue Max, Planet of the Apes, Patton, Tora! Tora! Tora!, Papillon, Chinatown, Logan’s Run, Legend, Alien Nation, The Burbs, many of the Star Trek films. He did so many memorable scores that stand out and are landmarks in film. When Goldsmith died in 2004 the cinema world lost a true master in film making. The music world lost a music genius. Twilight Time honored a passionate master with this special feature. Audio Commentary with Film Historians Lem Dobbs, Julie Kirgo, and Nick Redman, boy you have a three-way triple treat on this one. Three film guru’s talking it out, what more could you want. All three are very knowledgeable and are truly gifted in their love of cinema. It’s always a true treat, and huge plus to experience these three. Loved it. Twilight Time Blu-ray has never let me down to date in bringing out high quality perfection on disc. They give a wonderful testament in how to treat a film. Lilies of the Field is another prime example of that high quality. A great transfer. An awesome commentary and Isolated music feature which I always love. This is another must own Blu-ray. A flawless perfect film that still maintains its brilliant side after all these years. It’s one of the great films. One of the great acting roles ever. To me, this is a film that stands the test of time as being important. Highly Recommended.